You can use it in your planners too! I just can’t tell you enough about this collection! I absolutely love it! The artistry. The vibrancy of the colors. The quality of the paper pad. You can tell so much love and hard work went into this paper line! Heck, you can pretty much say that about everything that Heartfelt Creations puts out there! And don’t let the children’s design fool you. When looking through this paper pad, you must think outside the box. Don’t limit yourself to using it just for children’s albums and projects. In fact, I will show you later on how you can use it for a very grown up and classy design! but today I’m sticking with my main point of this blog. I have a beautiful planner that I won from a YouTube channel Giveaway (Hi Markisha!!!) I started making planner videos right at the start of February; but then I let my time and projects get ahead of me, that I stopped somewhere around March. Well, with so much going on in my life now, I decided to get back to the basics, and begin using my planner again. You’ll be surprised how much more you accomplish when you have everything written down! I wanted to do something different with my planner, so I decided to use the Hearfelt Creations Berry Cafe collection. And boy did it turn out cute! The following video will show you my entire procedure for this week’s layout! Enjoy! I’ve been a fan of Heartfelt Creations for quite some time now. With their feminine paper pad collections, what’s not to love? And when I heard of their 2016 Design Team call, of course I wanted to participate! The following are my three projects that I turned in to Heartfelt Creations. Thank you for watching my video. Subscribe to my channel for FREE tutorials. And don’t forget to thumbs up, comment and share! Wish me luck! The following is a Vintage Mini Album that I received from my friend, Audrey. Audrey has a YouTube channel called SewGoodAll, where she shares many of her crafts and crafty finds. This Scrapbook Mini Album is part of a swap that I did with Ms. Audrey and I’m so glad we found each other! Thanks Audrey! I loved everything! In this video, you will see the opening of this happy mail and all the goodies that Audrey sent! For Free crafting Tutorials, sub to Decor8yourlife! Then don’t forget to thumbs up, comment and share my videos! DECOR8YOURLIFE HAS A NEW GIVEAWAY! 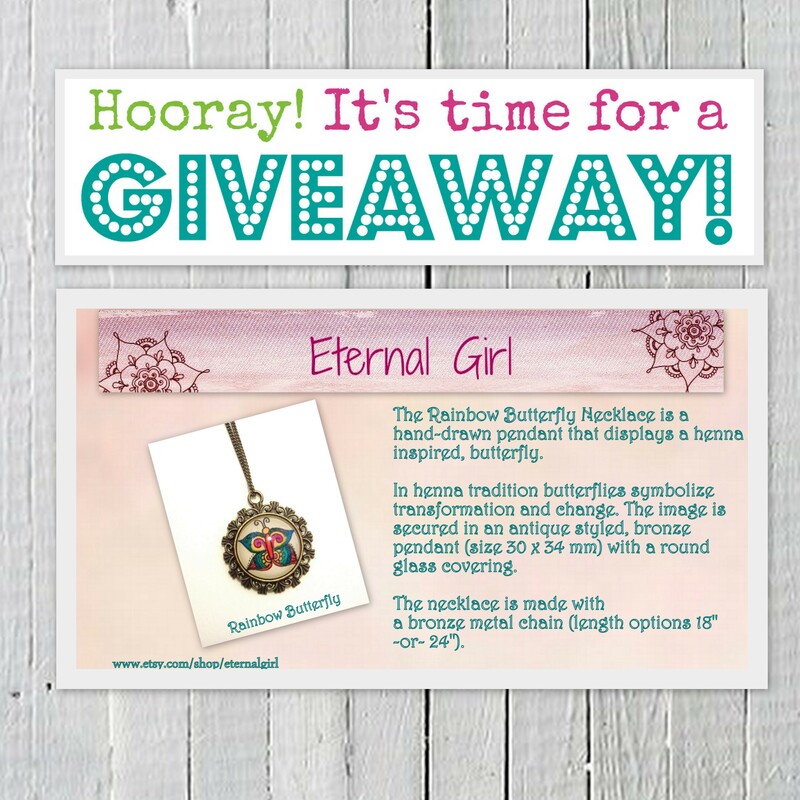 Eternal Girl is offering A beautiful Rainbow Butterfly necklace to a friend of Decor8yourlife.com! About the Rainbow Butterfly necklace: This hand-drawn, pendant necklace displays a henna inspired, butterfly. In henna tradition butterflies symbolize transformation and change. The image is secured in an antique styled, bronze pendant (size 30 x 34 mm) with a round glass covering. The necklace is made with a bronze metal chain (length options 18″ -or- 24″). Visit www.decor8yourlife.com and enter to win! The Fun and Elegant Beauty of MacKenzie-Childs.